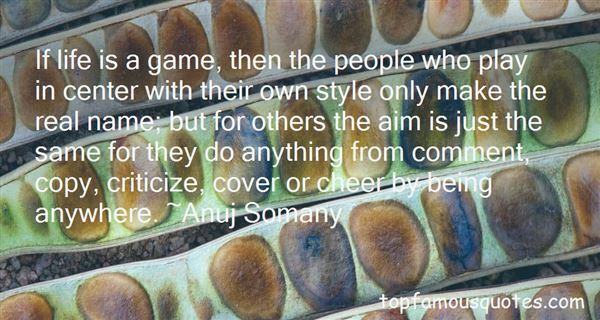 Reading and share top 25 famous quotes and sayings about Life Is A Game by famous authors and people. 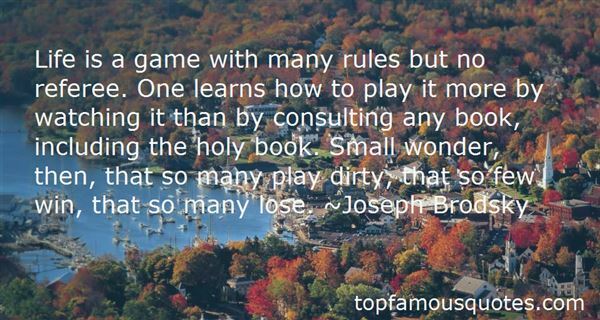 Browse top 25 famous quotes and sayings about Life Is A Game by most favorite authors. 1. "If life is a game, then the people who play in center with their own style only make the real name; but for others the aim is just the same for they do anything from comment, copy, criticize, cover or cheer by being anywhere." 2. "Every girl needs a bit of whimsy to remind her that life is a game and it's all about having fun." 3. "Much of life is a game. If played skillfully, with an intelligent and fascinating opponent, it can become almost a dance. One challenges and moves, the other teases and skips away, only to dart forward later and strike a telling blow." 4. "Well, you played me, Rabbit. You played me, and it worked, and I'm not the kind of person to make the same mistake twice. Your whole life is a game, but you know what? I already have a life. Poker's nothing to me but a goddamn deck of cards." 5. "Life is a game and every player is cheating." 6. "The game of life is a game of boomerangs. Our thoughts, deeds and words return to us sooner or later with astounding accuracy." 7. "Many Continentals think life is a game; the English think cricket is a game." 8. "Life is a Game; More You Play, More you learns"
9. "Life is a game where fair players are winners! But as for the "injury causers", "red-card" sees their end off!" 10. "Life is a game, boy. Life is a game that one plays according to rules." 11. "Imagine life is a game in which you are juggling five balls. The balls are called work, family, health, friends, and integrity. And you're keeping all of them in the air. But one day you finally come to understand that work is a rubber ball. If you drop it, it will bounce back. The other four balls...are made of glass. If you drop one of these, it will be irrevocably scuffed, nicked, perhaps even shattered." 12. 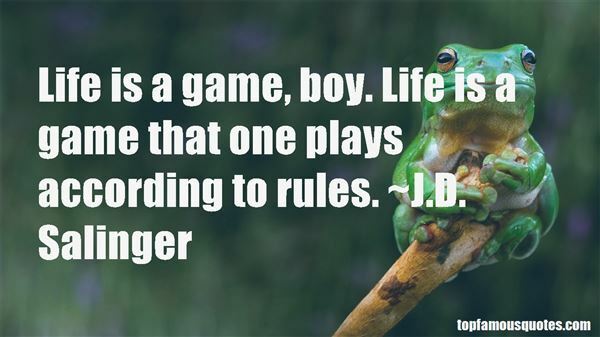 "If life is a game... I need new dice!" 13. "Life is a game with many rules but no referee. One learns how to play it more by watching it than by consulting any book, including the holy book. Small wonder, then, that so many play dirty, that so few win, that so many lose." 14. "Life is a game; so we should know very well how to play it." 15. "Who's straight? I'm not. I am bent gouged pinched and tugged at, and squeezed into this funny shape. Each life is a game of chess that went to hell on the seventh move, and now the flukey play is cramped and slow, a dream of constraint and cross-purpose, with each move forced, all pieces pinned and skewered and zugzwanged... But here and there we see these figures who appear to run on the true lines, and they are terrible examples. They're rich, usually." 16. "Each life is a game of chess that went to hell on the seventh move(...)"
17. "Life is an opportunity, benefit from it.Life is beauty, admire it.Life is a dream, realize it.Life is a challenge, meet it.Life is a duty, complete it.Life is a game, play it.Life is a promise, fulfill it.Life is sorrow, overcome it.Life is a song, sing it.Life is a struggle, accept it.Life is a tragedy, confront it.Life is an adventure, dare it.Life is luck, make it.Life is too precious, do not destroy it.Life is life, fight for it." 18. "I believe in a personal god who cares about me and worries and oversees everything I do. I believe in an impersonal god who set the universe in motion and went off to hang with her girlfriends and doesn't even know that I'm alive. I believe in an empty and godless universe of causal chaos, background noise, and sheer blind luck... I believe that life is a game, that life is a cruel joke, and that life is what happens when you're alive and that you might as well lie back and enjoy it." 19. "Life is a game, you live so you play. Follow your dreams and win what your happy heart desires." 20. "Life is a game and true love is a trophy." 21. "Life is a song - sing it. Life is a game - play it. Life is a challenge - meet it. Life is a dream - realize it. Life is a sacrifice - offer it. Life is love - enjoy it." 22. "Life is a Game you play only once you don't get the second chance and if you get you will never come in the same identity. So perform well." 23. "Life is a game. Money is how we keep score." 24. "All of Creation's a farce.Man was born as a joke.In his head his reason is buffetedLike wind-blown smoke.Life is a game.Everyone ridicules everyone else.But he who has the last laughLaughs longest." 25. "Life is a game of common sense. You can know all the data that the encyclopedia holds, but if you can't apply it to social situations and day to day events, you're on the same rank as someone with no data at all." I'm not a jukebox; I don't play exactly what the crowd wants to hear - that doesn't make sense. But, I do look at people requests. At the end of the day, they are the ticket payers and they are the ones that come to the show. If I played music that purely entertains me, I'd play very weird music."